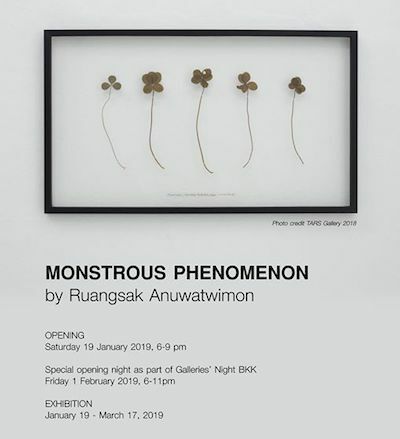 Ruangsak Anuwatwimon's exhibition Monstrous Phenomenon opened yesterday in Bangkok. Ruangsak's art examines the anthropocene and its consequences, and last year he visited Japan to observe the ecological effects of the 2011 Fukushima Daiichi nuclear reactor meltdown. A four-leaf clover is considered lucky, though five-leaf ones certainly aren't: they are genetic mutations caused by nuclear radiation. The exhibition features these and other plant and animal specimens from contaminated sites in Fukushima prefecture, including a bee from Minamisoma and a bovine lumbar vertebra from Namie. Monstrous Phenomenon runs until 19th March at 1Projects. Ruangsak's sculpture 'Transformations' was included in ห้องเรียนวาฬไทย at HOF Art Space, and his 'Ash Heart Project' installation was part of the Dialogues exhibition at BACC.